The square in geometry is a regular quadrilateral. It has four equal sides and four equal (right) angles. The rectangular form is an offshoot of the square, characterized by unequal length of the parallel lines. The abstract movement in the visualization of a square is from the outside to the inside, making the space enclosed (limited). The difference in approach – either from the inside (cross) or the outside (square) – can be traced back to the difference in psychological setting between the second (II, 2) or third (II, 3) part of the Second Quadrant (see also fig. 184). The city of Herat (Afghanistan) is a good illustration of the gradual nature of these two approaches in a historical urban setting. The inner city (madina) is enclosed by four walls with one gate in the east, south and west wall and two gates in the northern wall (GANGLER et al, 2004). The city is divided into four identical quadrants by two crossing main roads and the secondary streets originate from a regular grid pattern (fig. 560A-C). Fig. 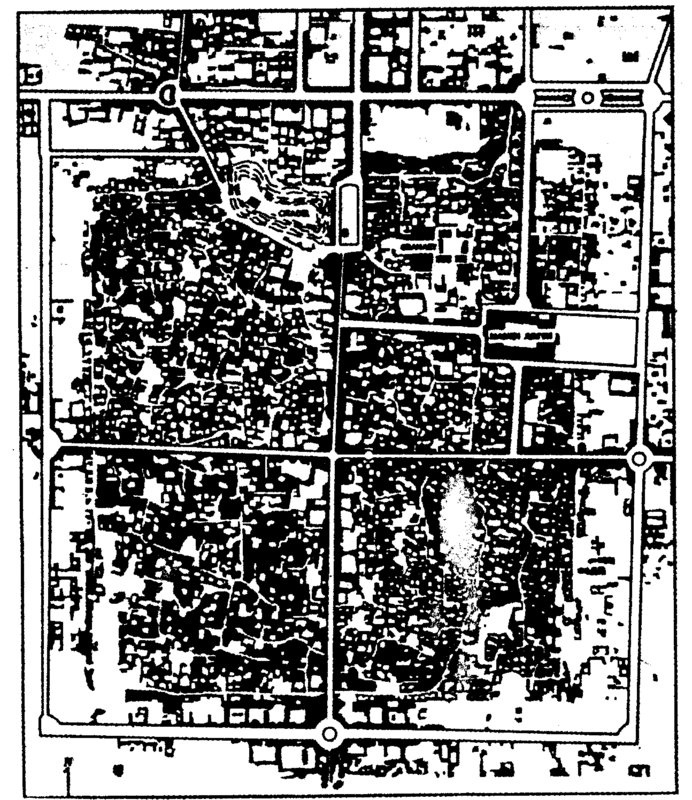 560A – A plan of the city of Herat (Afghanistan) combines a square outlay, following the cardinal points of the compass, with a cross pattern. The latter is formed by the two main roads, dividing the city in four quadrants. The original grid pattern is still visible in the secondary streets. The genetic history of the various geometrical elements is difficult to establish, just like the link with other square cities in the Middle East and China. GANGLER et al (2004) discussed the position of Herat in the context of similar cities like Bam and Zaranj (in Iran), Marv (or Merv; in Turkmenistan) and Bukhara (in Uzbekistan, see for their location fig. 405) and the many square cities in China. They dismiss the latter places as a source of influence, because the square Chinese cities only ‘have the geometrical division of the city space and the geometrical outline of the city walls in common’. However, a possible link with India cannot be excluded. There were close cultural contacts between India and Iran and knowledge of Indian treatises on architecture and urbanism (like the Manasara – The Essence of Measurements, ACHARYA, 1918) could have been present. Michael E. SMITH (2007) made some valuable remarks about the ‘planned’ or ‘un-planned’ nature of ancient cities in his article on ‘Form and Meaning in the Earliest Cities’. He rejects the simplistic dichotomy of an orthogonal plan (planned) versus an ‘organic’ layout (unplanned). Further inquiry into the definition of urban planning leads to three levels of meaning (as identified by Amos Rapoport): respectively, a high, middle and low-level meaning in built environments. The first, high-level meaning directs to supernatural symbolism and can be positioned – in a quadralectic interpretation – in the First (I) and/or Second Quadrant (II). The ancient cities were seen as images or ‘cosmograms’. Mircea ELIADE (1959), recognized four types of cosmological significance in his influential book (on the myth of the Eternal Return): 1. A parallel between heavens and life on earth; 2. The link between earth and cosmos in the axis mundi; 3. The cosmos as laid out in four cardinal directions and 4. The need for divination and augury to identify the sacred places on earth. 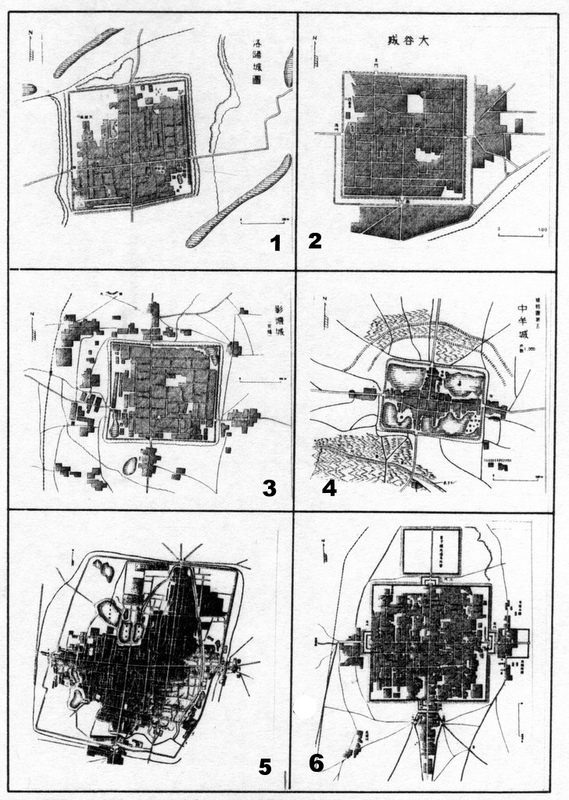 The exploratory work of Eliade was carried further by Paul WHEATLEY (1971) and applied to the ancient cities of China. The middle-level meaning refers to messages about identity, status and power. These things belong to the Third Quadrant (III) as the end members of a process of twofold comparison. The association in architecture is found in expressions of monumentality and formality. The former includes buildings whose construction uses more resources than would otherwise be necessary. The latter (formality) is a wide concept, which expresses itself in straight avenues (axiality), open plazas for public gatherings, symmetrical arrangements of buildings and sometimes enclosed areas with protective walls and gates. Michael Smith noted that ‘people developed a sense of identity with their city and ruler through their participation in such construction projects’. The low-level meaning implies a negotiating of the built environment and is set in a general emotional context. The influence of a city and its patterns of access can be placed in a Fourth Quadrant environment. A modeling of (ancient) urban sites might reveal certain types of behavior, how people used their urban surroundings and give clues about the sociological and political setting. This theatrical aspect – familiar as a characteristic of the Fourth Quadrant (see the scheme in fig. 331) – is highlighted at this stage of inquiry. Orthogonal city planning was singled out by SMITH (2007) because the use of right angles is often (wrongly) associated with a ‘planned’ approach. He distinguished various degrees of such layouts. They run from semi-orthogonal urban blocks (like Çatal Höyük in Turkey and Mohenjo-Daro, a Harappan city in Pakistan; fig. 561) to an integrated orthogonal plan (like Teotihuacan in Mexico or Angkor in Cambodia) to modular orthogonal plans. 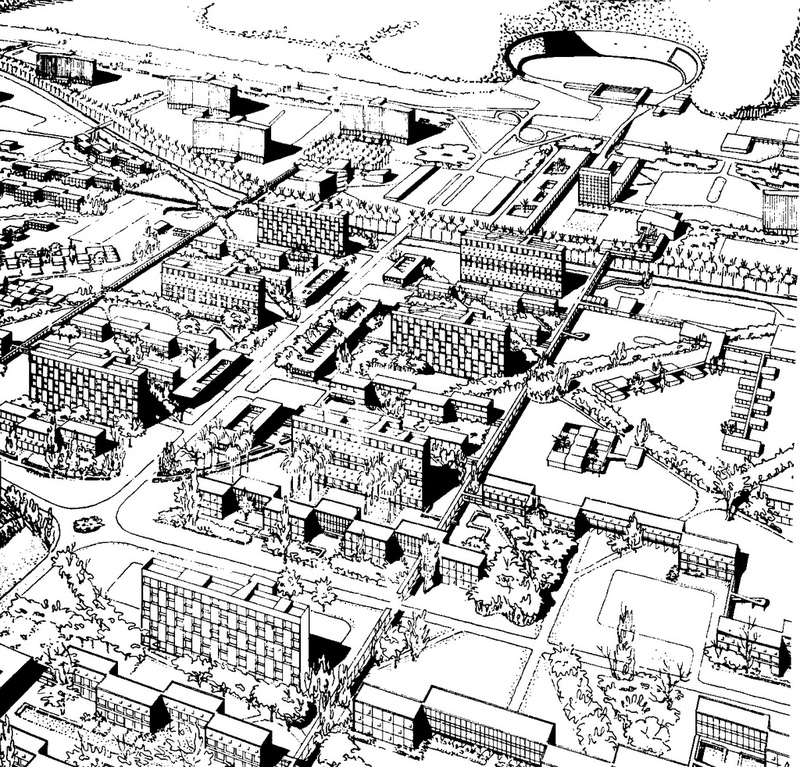 A great number of Roman cities, the Greek city of Olynthus and the pyramid town of Kahun (from the Egyptian Middle Kingdom) are examples of well-planned orthogonal city developments (CASTAGNOLI, 1971). Fig. 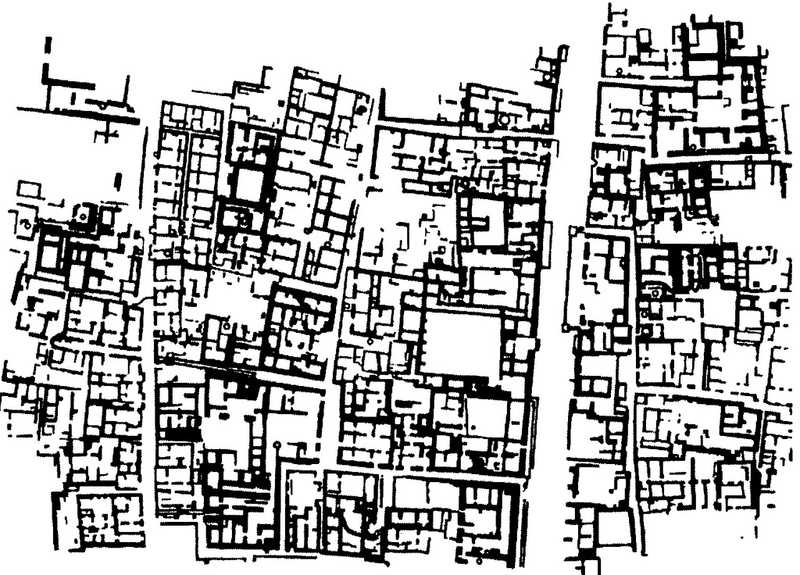 561 – Part of the city of Mohenja-Daro, a Harappan city in Pakistan, shows semi-orthogonal urban blocks, which were only partly planned. The ‘Mound of the Dead’ is part of the ancient Indus Valley Civilization that flourished between 2600 and 1900 BC. The square city – as a given entity – passes through various stages of meaning and can be assessed from different points of view. The religious and/or philosophical motivation is just one of the (four) feasibilities in the quadralectic school of thought. Ideas, materiality and sentiments are other vehicles of evaluation. ‘The Pivot of the Four Quarters’ is a scholarly work by Paul WHEATLEY (1971). It deals with the genesis of the city and the diffusion of city life during the Shang and Chou dynasties in China. The function of ceremonial centers is highlighted. The cultures of Meso-America, Central Andes, Africa, Mediterranean, Asia and eastern North America are brought together in a cross-cultural approach to search for a chronology of urban genesis. Finally, the cosmo-magical elements and symbolism of city planning (geomancy, orientation, axiality and the function of the center) are discussed. The title of the book points to the importance of the capital surrounded by Four Districts. The Chou-Li (Rites of Chou), a classical book on politics, justice, army and religion, opens with the statement that the Emperor himself determined the four cardinal points. The subsequent quinquennial pattern of organization, which evolves from the four directions and a center, lifts the fourfold to a higher level, which is a hallmark of the Chinese culture. These differences in division thinking might be one of the main causes of cultural misunderstanding between the East and the West. A formal definition in the quadralectic philosophy holds that a communication between partners with different forms of division thinking can only reach the level of the participant with the lower form. Even the four-fold way of thinking has to face this state of affairs. 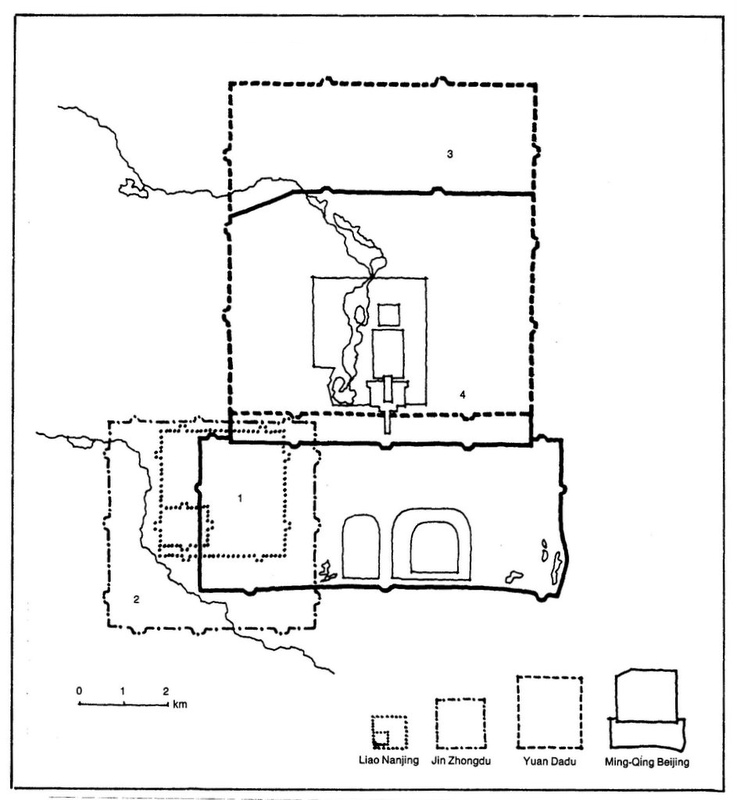 Oracle bones dating from the Shang dynasty (1765 – 1123 BC) revealed a hierarchy of rectangular walled cities, indicating an early adaptation to this type of city plan. The term cheng referred to the inner enclosure of a city, while du was used for the capital. The syllable du is defined as a ‘walled town having an ancestral temple with the spirit-tablets of former rulers’. The term yi was used in the Shang and Zhou periods as an indication for small towns (STEINHARDT, 1990). The square and grid-type was often used during the feudal empire of the Zhou (Chou) dynasty (1123 – 256 BC). A regional system of settlements was imposed upon the country with orthogonal land-planning methods and consisting of functional cellular units. The ideas behind the planning were practical (irrigation), but also had a philosophical and cosmological component (fig. 562). The world was seen as an infinite series of lines parallel to the cardinal directions. The results of this vision were highlighted in the ‘Tsing-tien’ land planning system by Meng-Tse (371 – 288 BC). The land was divided in sections of one ‘li’ (about 530 m) square, further divided in the form of the character ‘tsing’(#) into nine equal squares (or Fu) and each of these squares was divided into hundred lots or Mo. Fig. 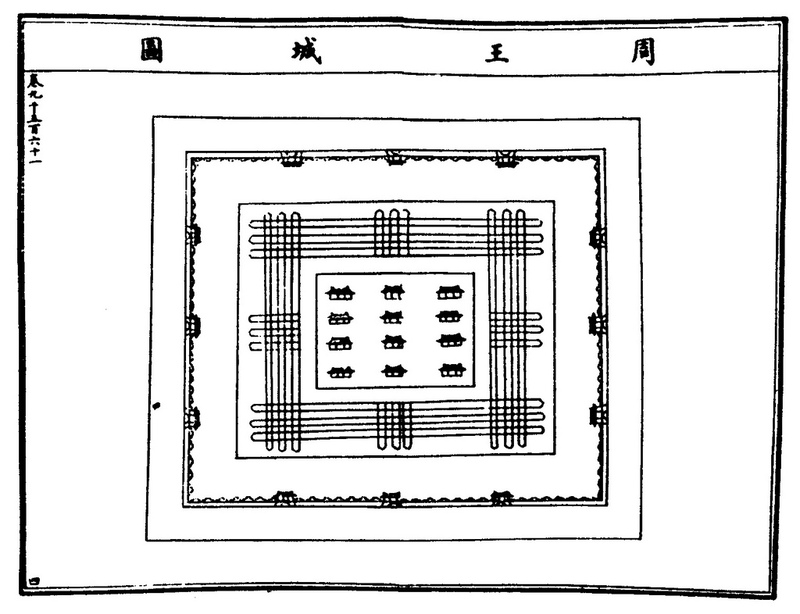 562 – The plan of the ideal city of Wang-Ch’eng followed a canonical plan as it was laid out in the K’ao-kung Chi (or Kaogong Ji, Record of Trades, presumably written in the first century AD), which is part of the Ritual of Zhou. Xi’an (Hsi-an or Chang’an, meaning ‘Perpetual Peace’) was one of the Four Great Capitals of China (fig. 563/564). This city probably approximates most closely the canonical prescription of a Chinese city. The walls of Xi’an were first built in the T’ang Dynasty (618 – 907 AD) and repaired in the Ming Dynasty (1368 – 1644; see fig. 391 for an overview of the Chinese cultural history). 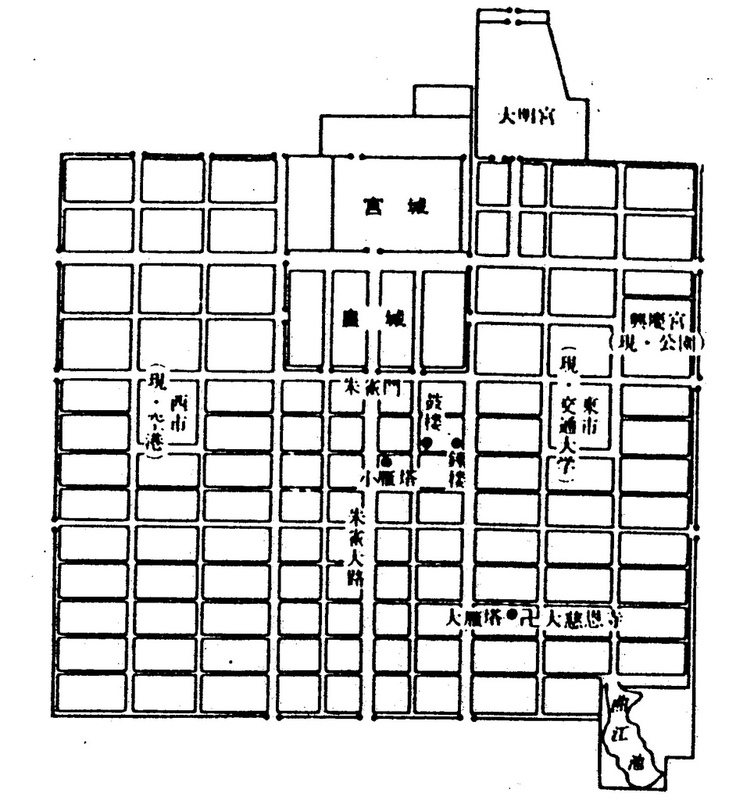 The city conformed to the scheme of an ideal Chinese town with a quadrilateral (square) shape generated by a nine-square grid: three gates on each side, therefore, twelve in all. Fig. 563 – The modern city of Xi’an in the central province of Shaanxi was once one of the old Chinese capitals and build according to the guidelines of the Ideal City. The city – here on a map drawn in 1982 – was an important center in the eighth century AD, at the eastern end of the Silk Road with over hundred Buddhist and Taoist temples, four Zoroastrian sanctuaries and two Christian churches and a mosque. The traditional concept of Chinese urban planning reflects a cosmological order based on Confucian ethics and fengshui (geomancy). The former seeks a rational order with an emphasis on the centrality of relationship, while the second was focused on a harmony with nature. The ‘science’ of fengshui may literally point to ‘wind and water’. It can be a ‘mere short-hand for an environmental policy of “hindering the wind and hoarding the waters” (FIELD, 1998). Stephen Field noted that fengshui had little to do with a physiological level, but required the belief in a force of destiny or fate. He would like to change the common (Western) translation of fengshui as ‘geomancy’ by the neologism ‘qimancy’, pointing to a divination according to qi – the concept of life’s energy or essence. The ‘breaths’ are everywhere and can be seen as a continually moving energy, circulating through the body. It would translate in quadralectic terms as the application of the CF-graph as the guideline of existence. The Chinese ‘ideal city’ was based on the very assumption that its squareness and subdivision represented the essential elements of living on this earth in much the same way as a quadralectic thinker would accept that (four) division and movement are omnipresent fundamentals. The cosmic scheme was called the ‘Great Plan with its Nine Divisions’ (Hung Fan Jiu Chou), which was first mentioned in the ‘Book of Historical Documents’ (Shoo King). 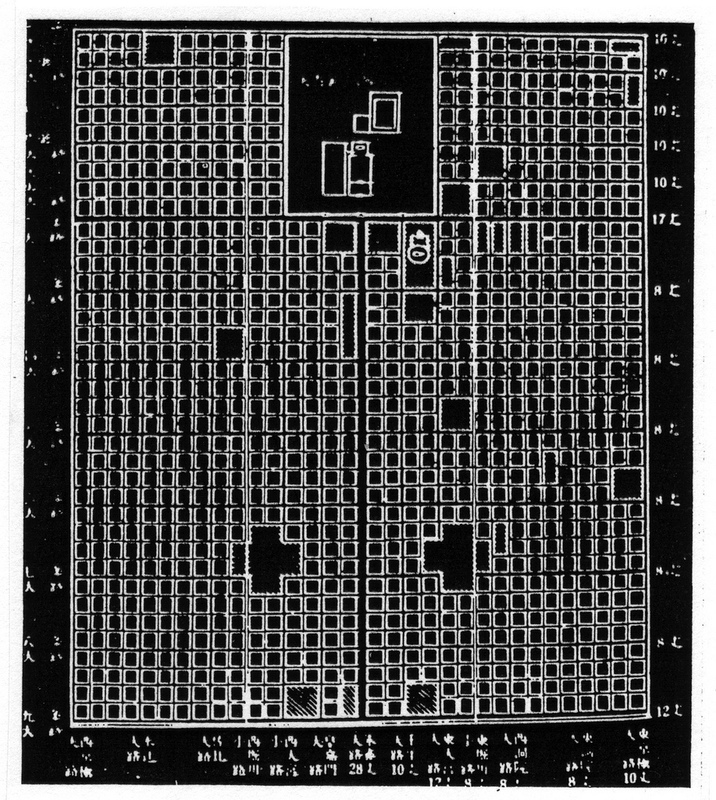 This ‘Great Plan’, with nine squares as its base, might represent an ancient Chinese categorical system (TZE-WAN KWAN, 1995). Spiro KOSTOF (1991) pointed, in his inspiring book on the city as a cultural artifact, also to the axial alignment, which is so typical in Chinese urbanism. The square or rectangular form was aligned in the four cardinal directions and a separation into functional zones (fig. 564) was eminent. Adjustment took place in line with topographical conditions. Fig. 564 – A reconstruction of the city of Xi’an (Chang’an) during the Tang Dynasty (618 – 907 AD). The regular street pattern was a well-planned effort to reach for the Ideal City. The Ta-ming Palace is situated in the north eastern corner of the city with the Lotus Garden in the southeastern corner. The T’ai-chi Palace and the governmental centre lies on the northern part of the central axis. The city of Xi’an became a model for the city of Nara (Heijokyo, near Kyoto (Japan). Emperor Shōmu made a new capital here (fig. 565). He moved again in 784 to Nagaoka due to the pressure of the Buddhists and their temple culture. Some ten years later he relocated one more time (in 794) to Heiankyo (capital of tranquility and peace, kyo meaning large city or capital). This latter place grew into the present-day Kyoto (Heian), situated on the central part of the island of Honshū. Fig. 565 – Heiankyo (Kyoto, AD 784) was a Japanese centralized town modeled after the Chinese city of Changan (Xi’an). The period between 710 and 794 is called in Japanese history the Nara period, which was followed by the Heian period, lasting from 794 to 1192. The Heian period was an important era from an artistic point of view and the Japanese consider the period after the move to Kyoto as the epitome of their classical culture. The city became a focus of development of a kind of (religious) architecture, using mainly wood as the building material. The art of Japanese gardening had its influence all over the world. The Ryoanji (Deer Garden) and Daitokuji, both in Kyoto, are excellent examples of the kare-sansui style (dry landscape gardens), which have a highly symbolical meaning. The main elements of kare-sansui gardens are rocks and sand. The raked sand suggests rippling water and the rocks are chosen for their natural beauty and often named after various Chinese mountains. Few temples were built in the original city of Kyoto during the Heian period, because the aristocrats did not like the Buddhist influences. This attitude had to change after the civil war when members of the samurai warrior class took power and moved the capital to Kamakura (near Tokyo). This event in 1185 marked the beginning of the Kamakura period (1185 – 1333). The Zen sect of Buddhism became an important influence on the culture of that period. Many Zen temples – like the Kenchoji Temple and monastery and the Engakuji Temple – were built in Kamakura. Fires or earthquakes (1923) destroyed both original temples and the present buildings are reconstructions from a later date. The Ashikaga shoguns took power in 1333 and moved the capital back to Kyoto. This part of the Japanese history is called the Muromachi period (1333 – 1573). Many Buddhist temples were built in Kyoto between the thirteenth and sixteenth century of which the Kinkakuji (Temple of the Golden Pavilion) is the most impressive. The present pavilion is also a replica (of 1955), since a monk set fire to the temple in 1950. Kyoto remained the capital and seat of the imperial court until 1868, when the emperor moved to Tokyo. 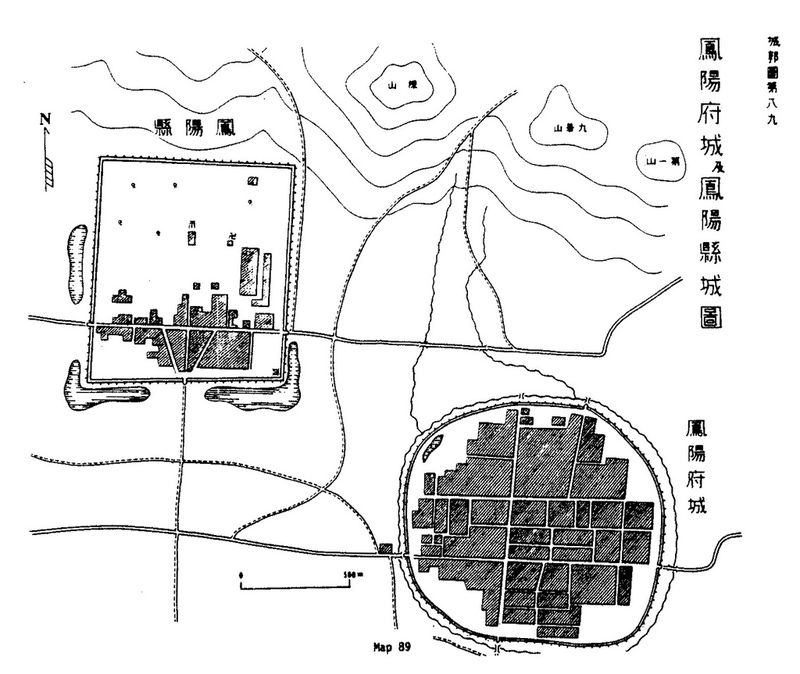 Further imitations of Chinese (Tang) city layout can be seen in the plans of other eighth-century Japanese capitals, like Naniwa (Osaka), Shigaraki (Shiga) and Kuni (Kuni, Kyoto). The Chinese influences in Japan seemed to diminish after the Nara period. However, the development of ‘geometric’ cities in China itself went through further stages. The square and rectangular layout was part of a wide range of city plans, which are distributed in time and place. Only a limited number are given here and further study is recommended. The ‘Forbidden City’ in Peking (Beijing) was built in a similar fashion as Xi’an, but the two cities have also fundamental differences (STEINHARDT, 1986; KOSTOF, 1995). Xi’an (Chang’an) under the Tang dynasty (7th – 9th centuries) had the imperial palace at the north end of the central axis. Beijing and its capital scheme were of a much later date. It seemed that the Mongol ruler Khubilai Khan revived the old scheme in 1267, when he built his Mongolian capital Dadu on the present location of Beijing, just to confer his legitimacy of his non-Chinese regime. The later building of Beijing retained the resurrected type and the conservative Ming dynasty held on to the classical cosmology used for town planning. The palace is in Beijing in the center of the city (fig. 566). Fig. 566 – The two ancient schemes for Chinese imperial capitals, according to Spiro KOSTOF (1991). The royal palace of Chang’an is situated on the northern site of a central axis (top), while the palace takes a central position in the plan of Beijing (below). Nancy STEINHARDT (1986) noted that the resemblance of the various imperial capitals was also due to the necessity of the rulers to ‘stick to the book’. Any deviation to the ancient plans could point to a doubt in the legitimacy of the government. 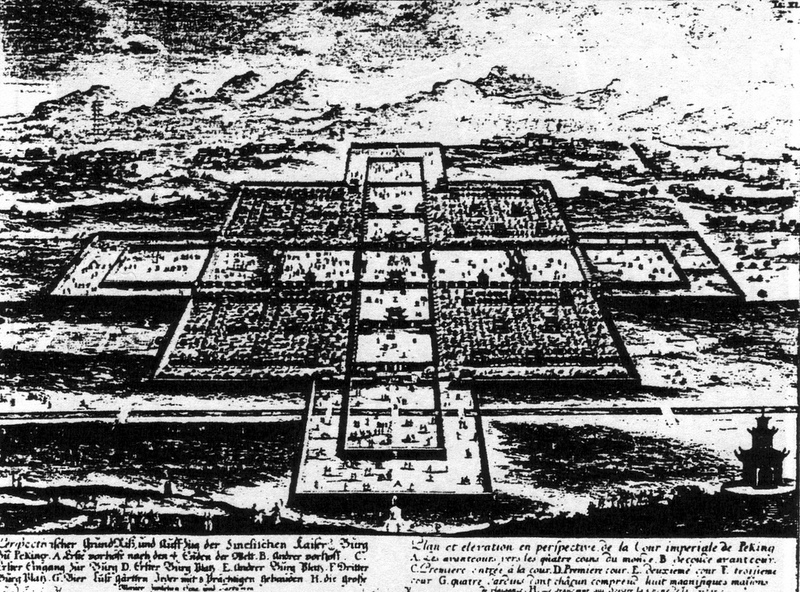 Beijing was laid on the principle of a cross superimposed on a square as was illustrated by Johann Fischer von Erlach (1656 – 1723) in his famous book ‘Entwurf einer Historischen Architektur’ (1721) (fig. 567). Fischer started the book in 1705 ‘as an innocent pastime’ and the publication took place in 1721. The work can be considered as the first worldwide approach to the history of architecture and tells something of the (scientific) scope of the European cultural unit-as-a-whole (see for the spirit of the time also fig. 498). The design of Peking (Beijing) – in Fischer’s book – was derived from a publication by Johan Nieuhof (1618 – 1672), working as a diplomat and draughtsman at the embassy of the Dutch East India Com-pany (VOC) to Peking in 1656. He published in 1665 an encyclopedic work (‘Het gezantschap … aan den groten tartarischen Cham’) containing some hundred and fifty prints, made after Nieuhof’s own sketches. Fig. 567 – Design for the imperial palace in Peking, as drawn up by Fischer von Erlach at the beginning of the eighteenth century, after an illustration by Johan Nieuhof, an employee of the Dutch East India Company (VOC) in Beijing in 1656. The city of Beijing has an archaeological history going back for more than three thousand years and its identification as China’s capital spans the Jin, Yuan, Ming and Qing dynasties (see fig. 391 for an overview of the Chinese chronicle). 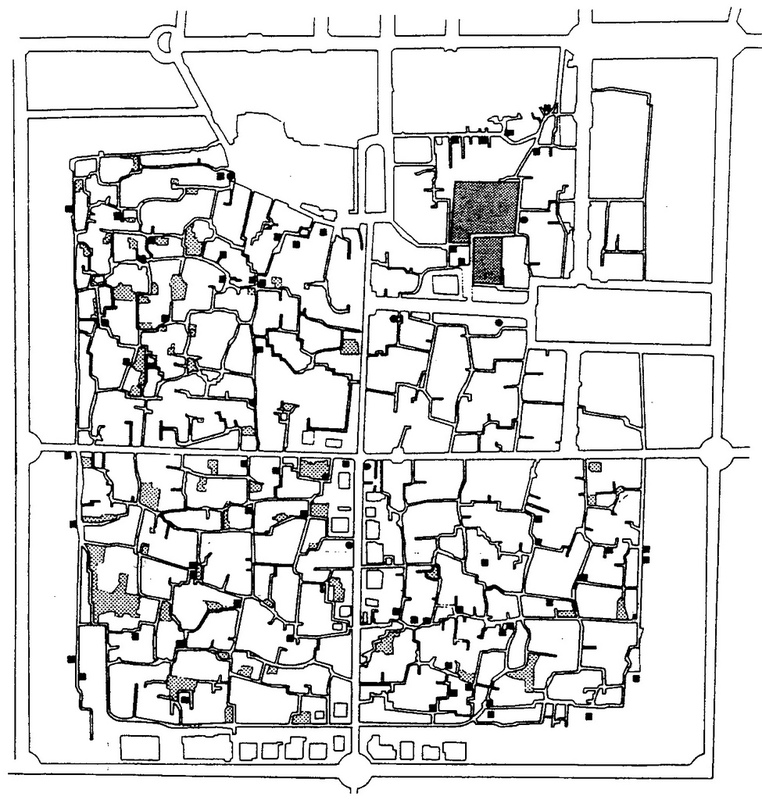 The ground plan of the capital shows through history a ‘moving’ square and rectangle (fig. 568). It started in the southwest part of present-day Beijing in the Liao Dynasty as Nanjing (the Southern Capital) in 936. Then it expanded in the Jin Dynasty in 1153 and was named Zhongdu (the Central capital). The position was in the area around Tianningsi. The Pagoda of the Tianning Temple, built in 1120, is an architectural master-piece of this period. The city of Zhongdu was rebuilt, after the burning of the Mongols in 1215, by the founder of the Yuan Dynasty, Khubilai Khan in 1267. He called his capital Dadu (Great Capital). Khubilai was the grandson of Genghis Khan, the famous Mongolian ruler, who died in 1227. The place was known in Marco Polo’s accounts as Cambuluc. The Yuan Dynasty fell in 1368 and the city was later rebuilt by the Ming Dynasty (under the third Ming emperor Zhu Di) in 1421, when it got the name Beijing. The first emperor of the Qing dynasty, Shun Zhi, retained the capital in Beijing in 1664 (fig. 568). Fig. 568 – The various stages and positions of the capital Beijing through the ages. 1. Nanjing (Liao Dynasty); 2. Zhongdu (Jin Dynasty); 3. Dadu (Yuan Dynasty) and 4. Beijing (Ming-Qing Dynasty). The palace complexes of the Forbidden City are an important element in the urban structure of Beijing, because they are situated at a strong north-south axis (of 7.8 km) in the grid pattern. Four temples flank the complex, one in each cardinal direction. The Yue Tan (Temple of the Moon) stands to the west. The Ri Tan (Temple of the Sun) stands to the east. Di Tan (Temple of the Earth) is situated in the north, whilst Tian Tan (the Temple of Heaven) stands to the south. The location of the temples was established during the Ming Dynasty and follows the philosophical school of the ‘Five Elements’ (Yin Yang Wu Xing). Some other remarkable ‘planned’ Chinese cities will be mentioned here, but it should be noted that this selection is only a fraction of the many Chinese cities, which were built along geometric lines. North of the city of Xiaguan is the small town of Dali (Yunnan province), which has a square shape. It was founded in 937 AD and was the seat of the independent kingdom of Dali in the tenth century. The town is situated on the western shores of a lake and is now a tourist centre. Luliang in Yunnan Province (east of Kunming) is a well planned town with a bell tower in the center (SCHINZ, 1989; fig. 569). ‘The town was formerly a department (zhou) with special military functions. The Confucius Temple is situated in the northwest corner and the Holy East Mountain Temple (Taishan) was the main building on the east side. The southern part has the Temple of the God of War (Guandi) and the great Buddha Temple’. The southwestern corner of the city was modified to accommodate the changing river when the wall was built in 1382 AD at the beginning of the Ming Dynasty. Fig. 569 – The city of Luliang in the Yunnan province is a county town east of Kunming, which has all the characteristics of a planned town. 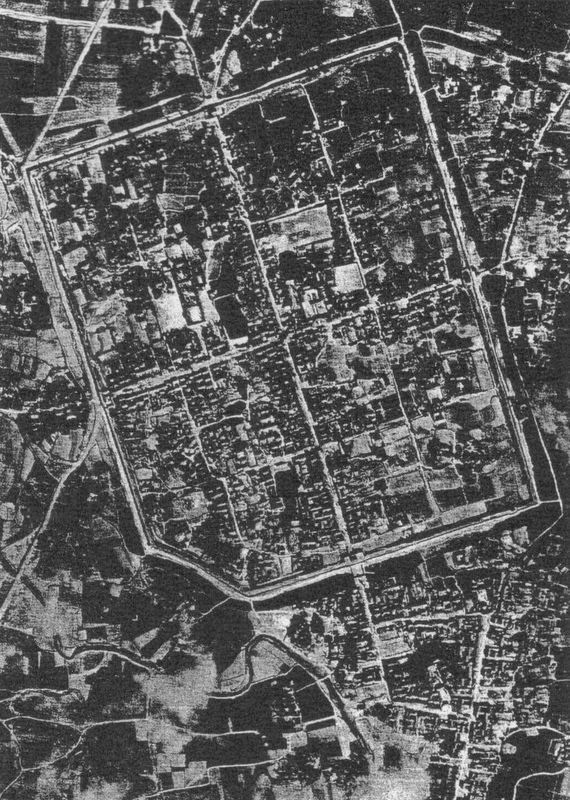 This aerial photograph (from 1944) shows the square city, divided by a cross in 4 x 4 blocks with four gates. The walls were built at the beginning of the Ming dynasty in 1382. The design was modified in the southwestern corner to adapt to change in the course of the river. Much further to the northwest in the Liaoning province of China has the town of Kaiyuan a special historical significance, because it was the place where the first Ming emperor reorganized the defense of the Great Wall in the fourteenth century. Kaiyuan, north of Liaoyang, had a strategic position and designed with a classical square plan (just like many other Chinese cities of that period). The County Magistrate, a Confucius Temple, City God Temple, a mosque and a tea market where all included in the walled area (fig. 570). Fig. 570 – The city plan of the old town of Kaiyuan in the Liaoning province, situated in the northeastern part of China, has a square layout and an internal cross, with four city gates. 1. County Magistrate; 2. Confucius temple; 3. City God Temple; 4. Drum tower; 5. Mosque; 6. Tea market; 7. The site of the proposed palace for the imperial prince of the Ming Dynasty. There are similarities of this plan with the city of Datong in Shanxi province. Shenyang is the capital of Liaoning province and the most important city in northeastern China (fig. 571). The city was also known as Mukden (in the Manchurian language). Chinese settlers lived here from the first millennium BC onwards and the first imperial capital was established in 1625. The inner city walls and the palace were built shortly thereafter. The North Mausoleum of Abukai – who was the first Manchu emperor of China – and his palaces (1627 – 1643) are the core of the city. Both are centered along a central axis. The outer city wall was built in the eighteenth century to protect the urban area. Most walls were demolished since 1949, but two gates and one corner tower of the inner city have since been rebuilt. The construction of the Mukden Palace (Shenyang Imperial Palace) followed the example of the Forbidden City in Beijing, but also has its own Manchurian style. The imperial residence moved to Beijing in 1644, when the Qing Dynasty replaced the Ming Dynasty (see fig. 391). The palace lost its status as an official residence of the Emperor, but Shenyang remained a prefectural city. In modern times, it has developed into a major industrial city. There are no slums or makeshift shantytowns because of the cold winters. 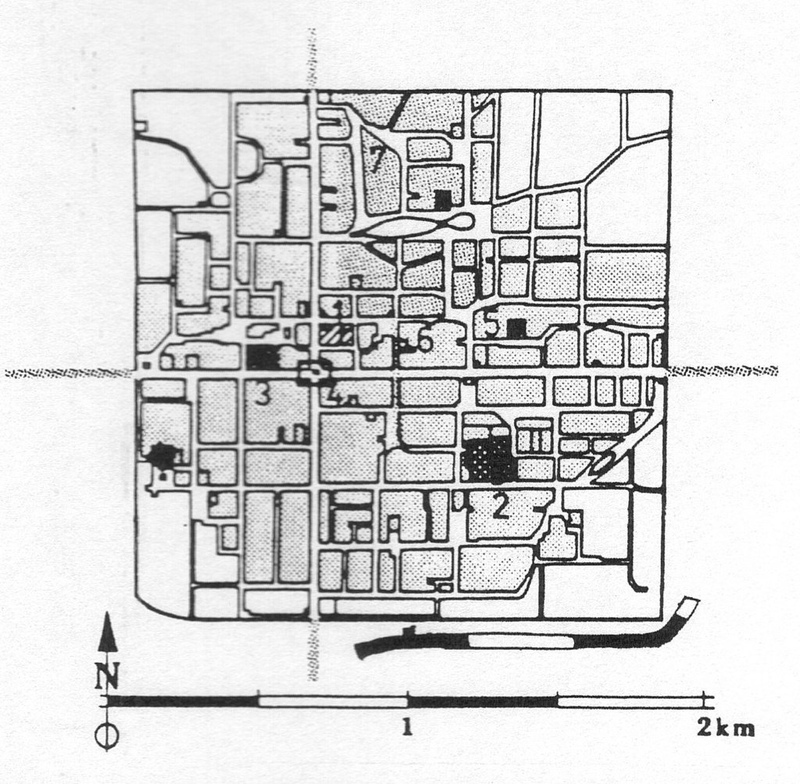 Fig 571 – This plan of Shenyang, the capital of Liaoing province, shows the square city enclosed in later expansions. A semi-circular wall around these extensions makes up a new unity. 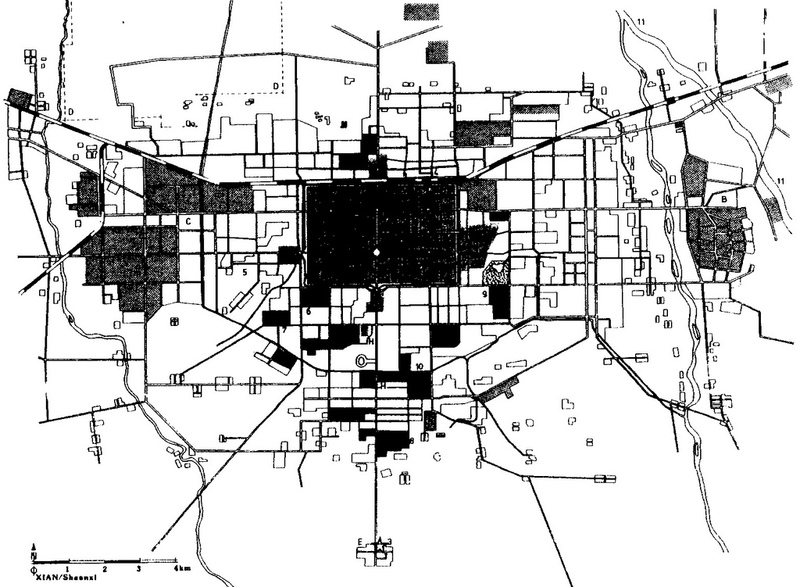 The ‘Atlas of Chinese Walled cities’ (WALLACKER et al, 1979; KNAPP et al, 2000) is a storehouse of different city plans from all over China, indicating a whole range of geometric designs. The various plans in the book – from the circular, cross to the square and rectangular – proof that city planning was a well-developed art in the cultural history of the country. It is hard to guess, if the actual ground plans and layouts of the walled city represented some spiritual significance (like a reference to a square earth) or was born in a practical sense of enclosure and protection. Most likely, a combination of these factors was employed. The circular defense system occurred in places like Haing-Tzu (thirty kilometers south of Chiu-chiang) and Chia-Ting Hsien (near Jiading, north-west of Shanghai). The latter walled city had crossroads inside, running NW-SE and NE-SW. The outline of the defense systems is still visible on aerial photographs (like Google Earth: 31º 23’00 00” N, 121º 15’00 00”). Kuei-Te (fifty kilometers east of Sui-hsien) was also defended by a circular moat, but the inner city was a square. The square design is probably the most prominent within the complex of walled Chinese cities. The outlay of Beijing is well known, but there are many more examples, from large to small. Only a few plans are given here (fig. 572). Further examples can be found in KNAPP et al (2000). Fig. 572 – A selection of Chinese Walled Cities of the square type as given by Ronald G KNAPP et al (2000). 1. The city of Loyang (or Luoyang) is situated in NW Henan Province on the Luo River. It was the capital of several ancient dynasties (Eastern Chou kingdom, 730 – 256 BC and Tang dynasty, 618 – 906 AD); 2. The walled city of T’Ai-Ku, fifty kilometers south of T’ai-yuan (capital of the Shanxi Province); 3. Chang-Te (An-yang) in the Henan Province, known from the excavations of the Yin Tombs (see fig. 390); 4. Chung-Mou in Henan Province; 5. Kaifeng (Pien), 32 km east of Chung-mou; 6. Ta-T’ung, northern Shaanxi Province. The outer walls were made in 421 AD, with a length of sixteen kilometers. A combination of the square and a round layout can be seen in the adjacent cities of Feng-yang-fu and Feng-yang-hsien. They are situated some hundred and five kilometers southeast of the city of Meng-ch’eng (Anhui Province) (fig. 573). Fig. 573 – The cities of Feng-Yang-Fu and Feng-yang-hsien, some 105 kilometers southeast of Meng-ch’eng, discloses the proximity of two different types of city building. 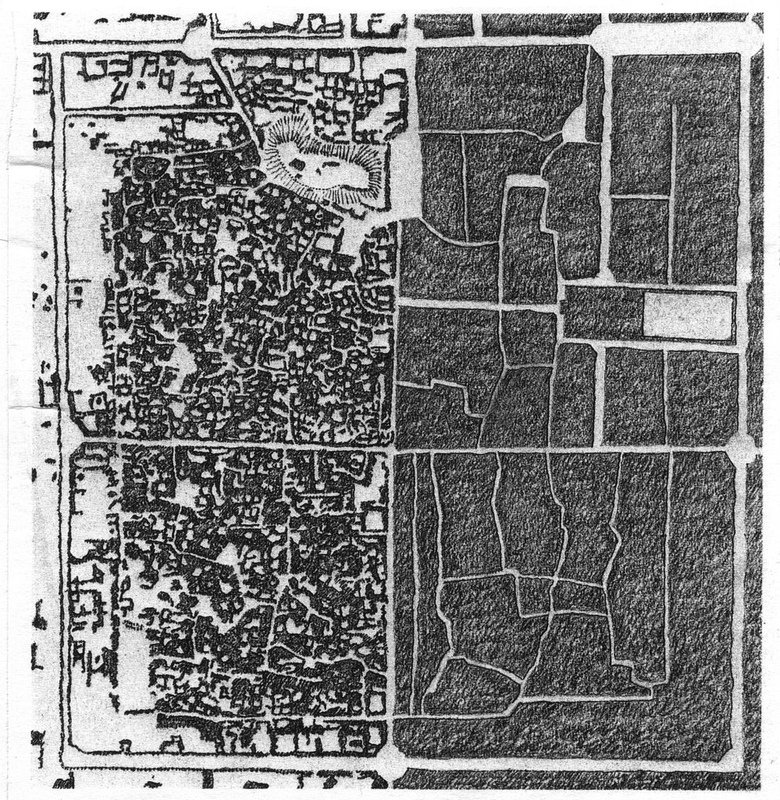 The concept of the square city might have its widest application in China, but other parts of the world also used the same layout. The square (or rectangle), as the ‘Third Quadrant’ expression of division, has always been a powerful tool to create visible visibility (see fig. 242). Regular planning by orthogonal subdivisions has been a hallmark of urban design from very ancient times up to modern days. Often some governing body, dealing with the general distribution of land, is necessary to regulate the urbanization. The chessboard pattern (grid) is the most likely outcome if a spirit of egalitarianism prevails. The results are commonly more irregular if building is left to the individuals in an ‘organic’ process. 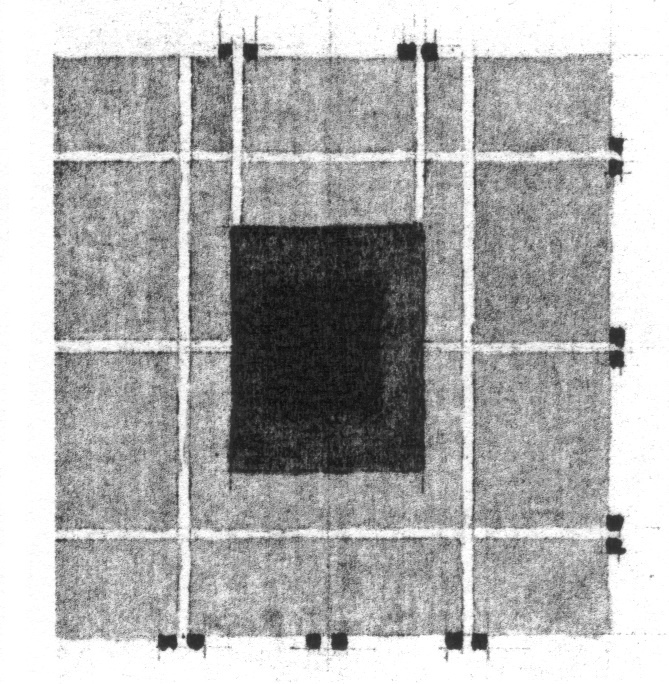 An interesting visualization of a square city is given in a manuscript in the John Rylands University Library in Manchester (Syriac Ms. 16, fol. 118r). 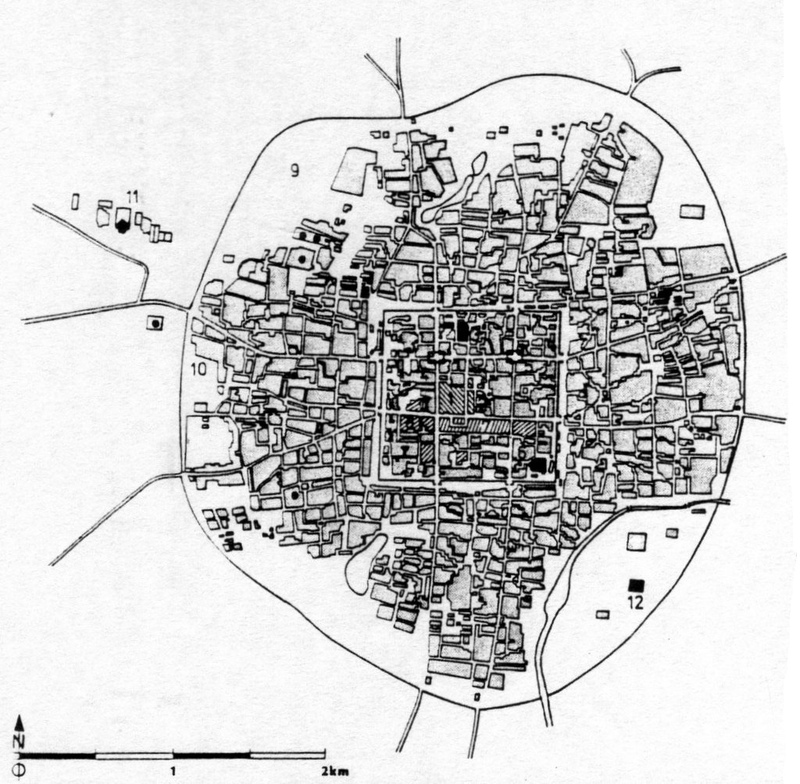 The city of Jericho is depicted here with seven concentric walls and has reminiscence to a labyrinth (fig. 574). 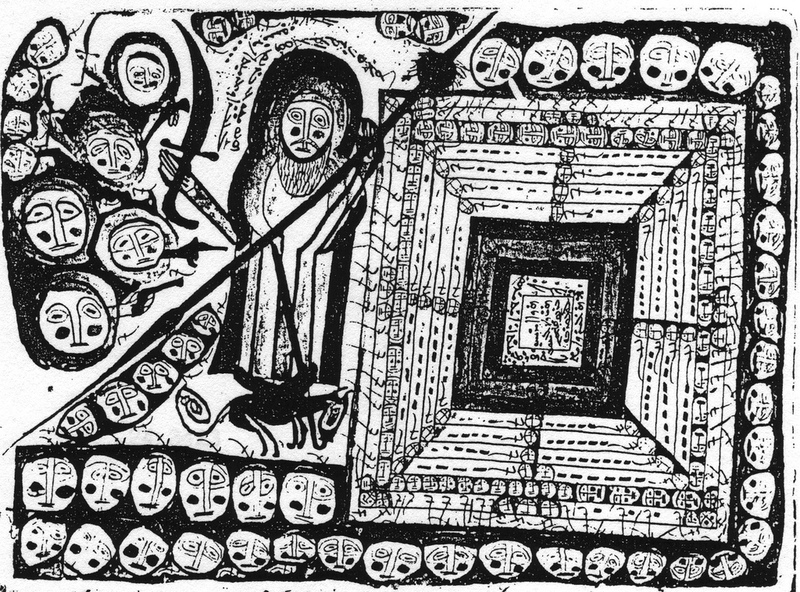 This illustration connects the (Third Quadrant) representation of a defense system (The Walls of Jericho) with the (Fourth Quadrant) theme of the labyrinth. The Biblical story that the city was eventually taken by betrayal adds a further psychological element to the efficiency of defense systems and labyrinths. Human wickedness can overcome the endeavors to create safety. Solutions to problems might just as well be found in the First or Second Quadrant, either in the form of (religious) faith or inventiveness. That is, in the end, the lesson of the Battle of Jericho. Fig. 574 – The representation of Joshua for the city of Jericho is a historical theme, which has captured the imagination of artists throughout the ages. The Biblical story tells of the battle of Jericho, which was won with help of a prostitute, who gave entrance to the city after Joshua’s troops had encircled the city seven times. Historic and relative simple examples of square designs are known from the countries under the influence of the Celts (ROSS, 1970/1986). 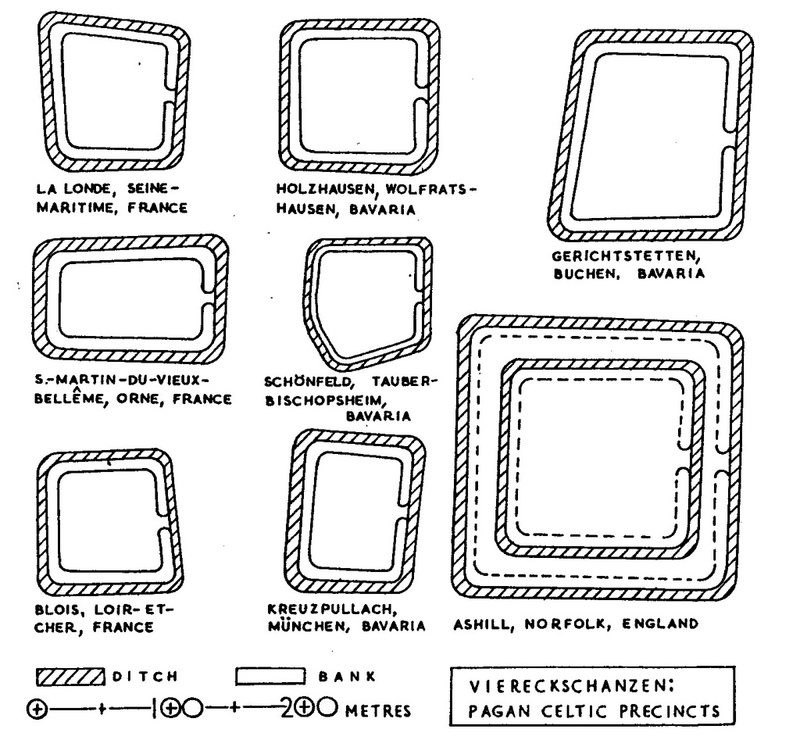 The rectilinear earthworks, known in Europe as Viereckschanzen, date back to the second or early first century BC (fig. 575/576). Fig. 575 – Plans of pagan earthwork precincts or sanctuaries in Europe as given by ROSS (1970/1986). Fig. 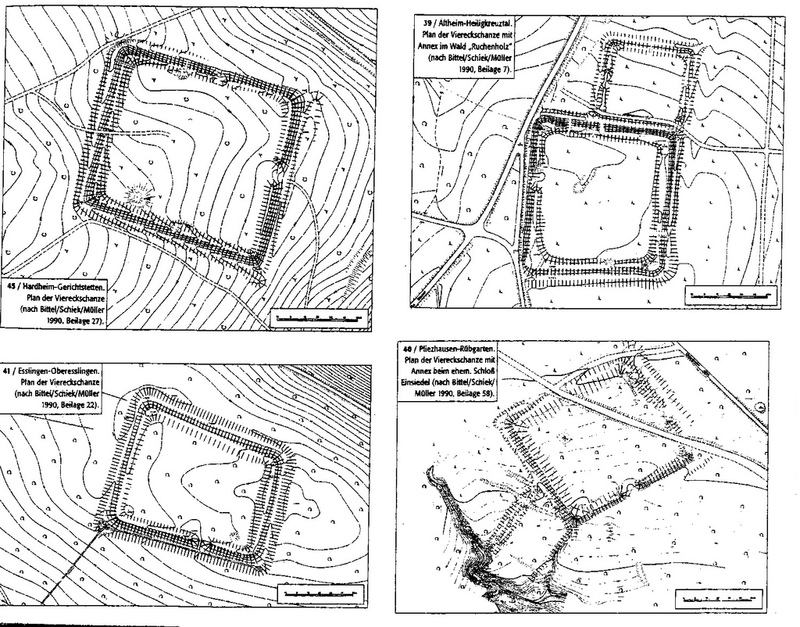 576 – Several plans of pagan earthworks known as ‘Viereckschanzen’ in Germany as given by WIELAND (1999). The German expression is composed of the word ‘rectangle’ (Viereck) and ‘entrenchment, redoubt’ (Schanze) and is sometimes abbreviated to VES. The places are regarded as holy places or sanctuaries, but a profane use cannot be excluded (like a cattle enclosure). The majority of the historic sites are situated in France, Southern Germany (Baden-Württemberg, Bayern) and Czechia (Bohemia). Some hundred and fifty VES’s are known from Germany alone. Furthermore, locations in France (Gournay), Belgium (on the Alfsberg near the municipality of Kontich near Antwerp), the Netherlands (near Nijmegen) and England (the bank-and-ditch enclosure in Ashill, Norfolk) have been studied. The latter location is a Romano-British site, which yielded many pieces of pottery (decorated daub) in two deep timber-lined wells (GREGORY, 1973). 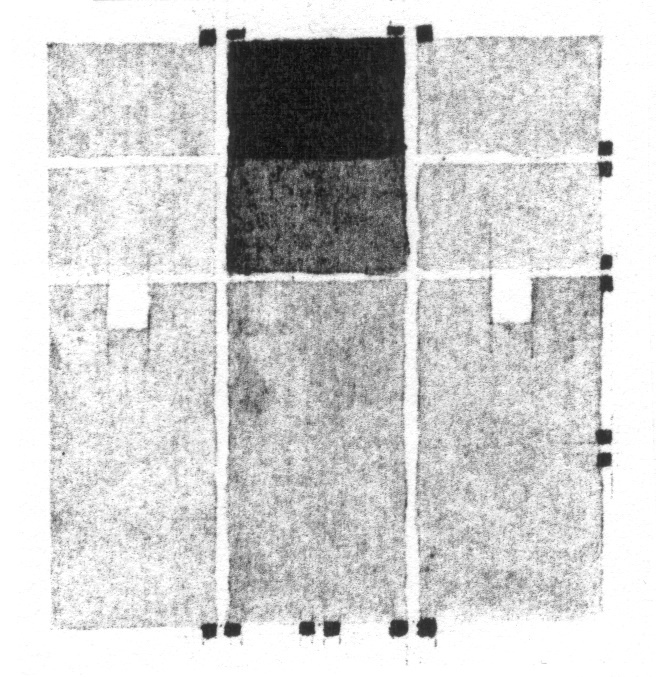 Günther WIELAND (1999) gave a detailed description of a number of (German) ‘Viereckschanzen’, which had their square or rectangular layout in common. The length of the walls is in the order of 100 x 100 meters or less. The trench was about two meters deep and the walls were at least three meters high, originally probably covered with sharp-pointed wooden palisades. 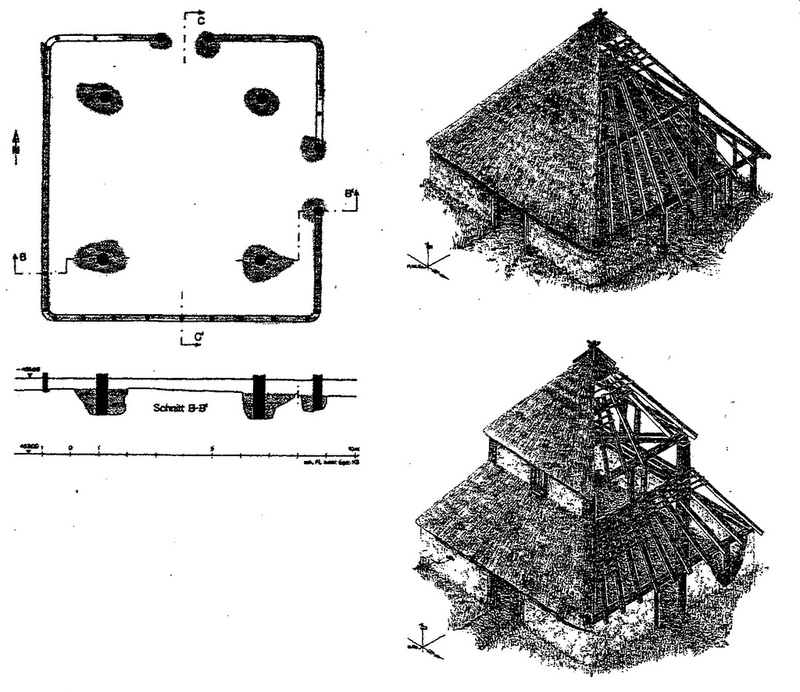 Wieland noted the relation of the housing pattern within the VES to the layout of the so-called Umgangstempel (see fig. 101 – 103) (fig. 577). Fig. 577 – Plan and reconstruction of a building in the south-eastern corner of the ‘Viereckenschanze’ Bopfingen. The upper building to the right is a reconstruction with a pyramidal roof. The lower picture to the right has a higher middle part, like a Roman ‘Umgangstempel’. The period of occupation was probably between the third and the first century BC. The square and rectangular design of settlements seems to be a universal human approach to city building. The practical aspect might be the main reason to go ahead along straight lines. For instance, the map of the thermal city of Dax (France) gives a layout with ramparts as an ‘enceite tetrarchique’ (square city walls) and four gateways. 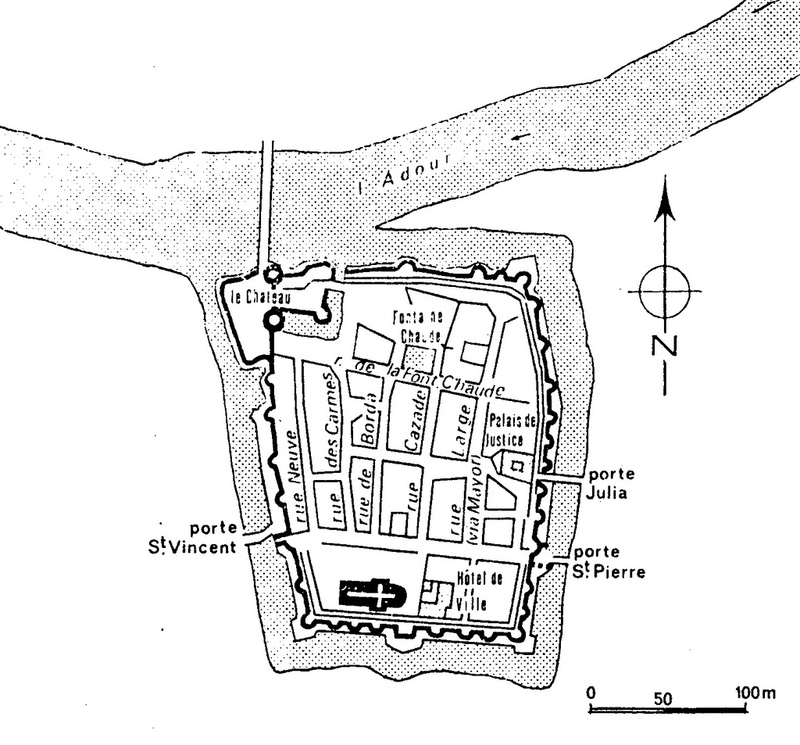 The diversion of the river Adour gave extra protection (fig. 578). The city was originally built in the fourth century around a ‘Fontaine Chaude’ (hot springs) and was reconstructed and modified in 1465 with forty-six turrets. The early ‘Roman’ city layout was smoothly adopted in the Renaissance to create a ‘new town’ with the square shape as its leading principle. Fig. 578 – A map of the city of Dax, a thermal city in south-western France (l’Aquitaine) shows the practical application of the square design. The city had a Roman origin (Aqua Tarbellicae) and was improved in 1465 with forty-six turrets and four gateways. The straightness of the square design got a new ideological impulse in the religious quarrels, which marred the European history in the sixteenth and seventeenth century. Many of these troubles were based on a difference of opinion in the way of division thinking. The European cultural history had reached its Pivotal Point (PP) in – or around – the year 1500 (see fig. 267). Dualism reached a marker point and many lines of thoughts could now be pushed to their limits. One of the consequences of this historical setting was the start of an age of unprecedented discoveries. Another was a deep confrontation about the interpretation of the dogmas of Christian belief. The revolution against the Roman Catholic Church was initiated in Germany by Maarten Luther (1483 – 1531) in 1517 and carried forwards by the Swiss reformer Ulrich Zwingli (1484 – 1531) and the French theologian John Calvin (1509 – 1564). Their protests are generally read in terms of religious bickering, but it is suggested here to interpret their efforts as a ‘struggle’ between different forms of division thinking. The eternal confrontation of the narrow and the wide, which is typical for any (quadralectic) communication, culminates in the third part of the Third Quadrant (III, 3). This position can be pinpointed for the European cultural history as the period from 1500 to 1650. The ‘victory’ (of the higher forms of division thinking) occurs subsequently in the fourth part (III, 4), which lasted in Europe from around 1650 to 1800. The Huguenots were a group of French Calvinists, who had their own national organization. A conflict broke out with the French Catholic king in 1562, which resulted in an official recognition in 1570. However, this victory was short-lived because the queen mother Catherine de Medici instigated a hate campaign against the Huguenots, which culminated in the St. Bartholomew’s day (24 August 1572) when all Protestants leaders were killed, probably about twenty thousand people. This massacre can be interpreted as the zenith of oppositional thinking in Europe. The struggle for (political) power used the division in religious opinions to reach its goal. The situation of the Huguenots improved in 1576 when they were granted religious freedom. The Edict of Nantes in 1598 legalized the situation and gave the Huguenots their rights and liberties. The Edict was revoked in 1685 by Louis XIV and persecuting of the Huguenots started again. Some four hundred thousand of them left the country. This historical situation provides an example of the internal differentiation in Europe, which is so typical for its cultural history. Some of the exiled Huguenots brought their ideas into the open, like the German architect and engineer Georg Böckler, when he designed the town plan for the city of Onoltzbach (or Ansbach), situated to the southwest of Nürnberg (Bavaria, Germany) (fig. 579). Fig. 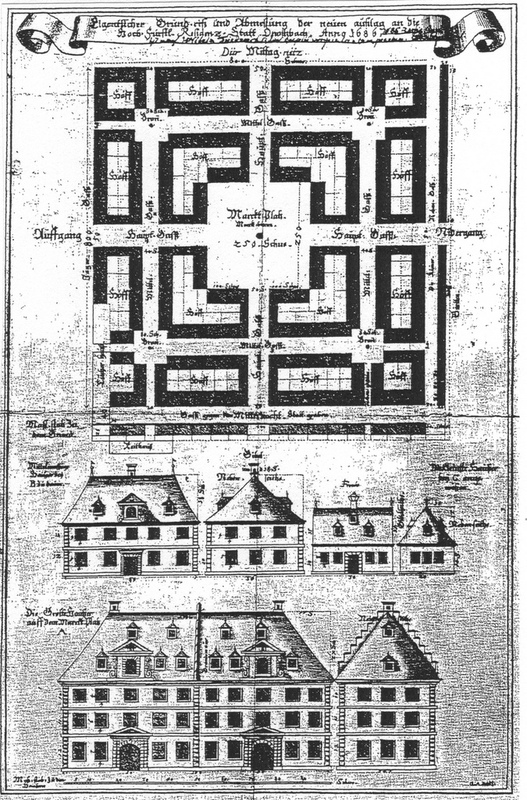 579 – The city plan of Onoltzbach (Ansbach) by the German architect Georg Andreas Böckler (1686) had a religious inspired layout based on absolutist ideas. The city had a reputation for a free printing press, which had such diverse books published like a Hebrew grammatical work by Joannes Meelfuherus (1607), Andreas Goldmayer’s ‘Harmonia Chymica’ (Onoltzbach, 1656) and Salomon Schweigger’s ‘Kurtzer Ausszug der Reysbeschreibung nach Constantinopel und Jerusalem’ (Onoltzbach, 1661). Georg Andreas Böckler (1644 – 1698) was the editor of the first German edition of Palladio’s work (Die Baumeisterin Pallas, Oder, Der in Teutschland Erstandene Palladius: Kommentierte Und Illustrierte Ubersetzung Der Ersten Zwei Bucher Von Andrea Palladios I Quattro Libri Dell’architettura). He also wrote the ‘Architectura Curiosa Nova’ (1664), which set the trend for the hydrodynamics of fountains and provided designs for grottos and garden pavilions – a fashionable item at the time (see Ch. 2.3). 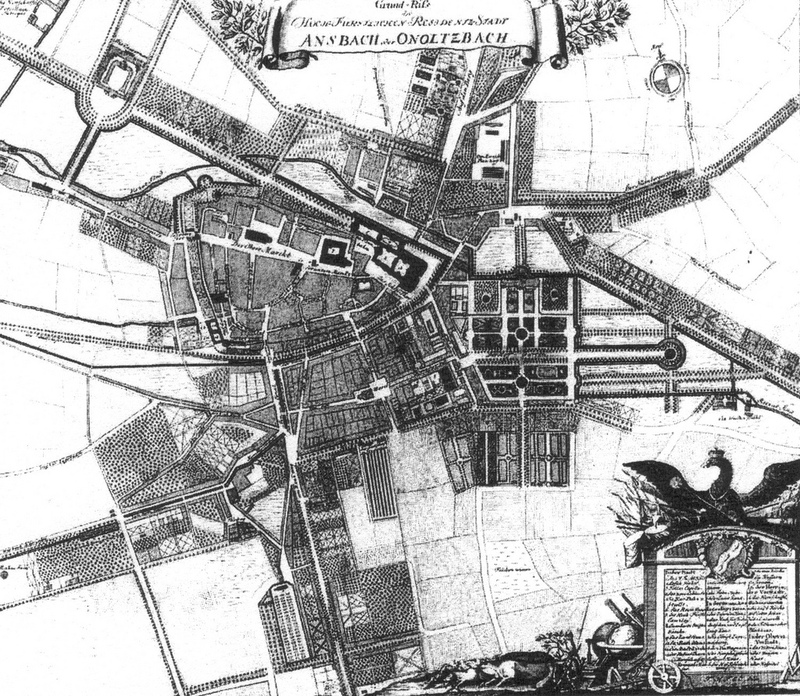 The city plan of Onoltzbach (Ansbach) by Böckler was never executed in the form he suggested, but a copper engraving by Johann Puschner and published by Johann Enderes in Schwabach in 1740, shows a rectangular city with a cross layout (fig. 580). It seems that at least the idea of a cross design had caught on. The historically interesting map of 1740 indicated a further park layout to the east along orthogonal lines, like it was fashionable in the beginning of the eighteenth century. Fig. 580 – A city map of Ansbach (Onoltzbach) from 1740 shows a three division between a semi-circular northwestern part, a bastide-like middle part and an orthogonal park (Hopgarten) to the east. A present aerial view of the city (Google Earth) still indicates the historical three divisions of styles, with modern parts of suburban housing added to the southwest and the southeast. The oldest part (Altstadt) around the St. Gumbertus Abbey (with its recently restored Wiegleb Organ) has a semi-circular street pattern, which is opened up to the south by the Medieval Herrieder Tor. The latter was transferred in 1751 into an octagonal Baroque building by Johann David Steingruber. The second part is the crossing of the Karlstrasse and the Karolinenstrasse, forming the intended extension of the city by Böckler, in a cross form. The third part is the square layout of the Hopgarten of the castle of the Margraves of Brandenburg-Ansbach (with the Orangery – built in the gardens from 1726 to 1743 – as its principal building. The modern suburban extensions can be regarded as the fourth member in a continuation of various ideas of city planning: from the circular (I) to the cross (II), limited to the square (III) and ending in the pluriformity of the linear-grid type (IV). The Roman figures between brackets point to the graphical expression of the quadrants (see also fig. 242). The city development in the second half of the twentieth century never strayed far from the straight and linear. The plan of the Cidade dos Motores in the jungle wilderness near Rio de Janiero (completed in 1949) was designed by the architects Paul Lester Wiener and José Luis Sert. The plan is archetypal for the incorporation of the idea of the square in the post-war city development, which occurred on a worldwide scale (fig. 581). Fig. 581 – The Cidade dos Motores (Motor City) in Brazil is a design plan by the American immigrant architects Paul Lester Wiener and José Luis Sert, which epitomizes the ideas of squareness in urban development in the second half of the twentieth century. It can be said, to conclude this chapter, that the square cities of the world comprise a multitude of occurrences with their own history in place and time. It is a challenge to distinguish the position of an ‘original’ square city within the intermingling of various other types of city layouts.